Welcome to Costa Rica, a small country in Central America with a population of nearly five million and which takes pride in the fact that it is a rapidly developing nation. San Jose is the capital and largest city of this nation with more than a quarter of the population living in it. ‘Pura Vida’ which means good life or pure life is actually the way of life in Costa Rica. So when you meet someone or if anyone greets you in Costa Rica, your response will be ‘Pura Vida’. Costa Rica was under the colonial rule of the Spanish in the 16th century. Prior to this, it was a sparsely populated nation inhabited by the native aboriginals and they lacked a strong civilization. It was Christopher Columbus, the sailor who landed on the eastern shores of Costa Rica and observed that the aboriginals had large quantities of gold worn as jewelry. The gold was later usurped from the natives by a Spanish Conqueror, Gil Gonzalez Davila. Even though the Spanish established colonies in Costa Rica, it was not much of importance to them because this nation was sparsely populated and finding forced laborers to look after the plantations proved futile to them. And precisely for this reason and for the fact that gold and silver resources were sparse, that Costa Rica was neglected and looked down upon as the poorest and miserable colony by the Spanish. How did Costa Rica gain independence? Well, they never had to fight for independence. Are you surprised? After Spain was defeated in the Mexican War of Independence, all of Central America was declared independent. So 15th September is celebrated as their Independence Day. But then the people of Costa Rica had to face a couple of civil wars. What is Costa Rica famous for? Costa Rica is famous for its coffee and produces the finest coffee beans in the world. Tourism is a hit in Costa Rica with people visiting its national parks and protected areas. This country is a rich treasure trove of flora and fauna. It is the most visited country in Latin America after Mexico. And tourism is responsible for a major share of revenue earning for the country. Spanish is the most widely spoken language of Costa Rica due to the Spanish invasion, but some native languages are still spoken though not in majority. Football is very popular sport of Costa Rica, with the national team having played in four FIFA World Cups. Education is also given due importance with Costa Rica being the highest in literacy rate among the Latin American countries. 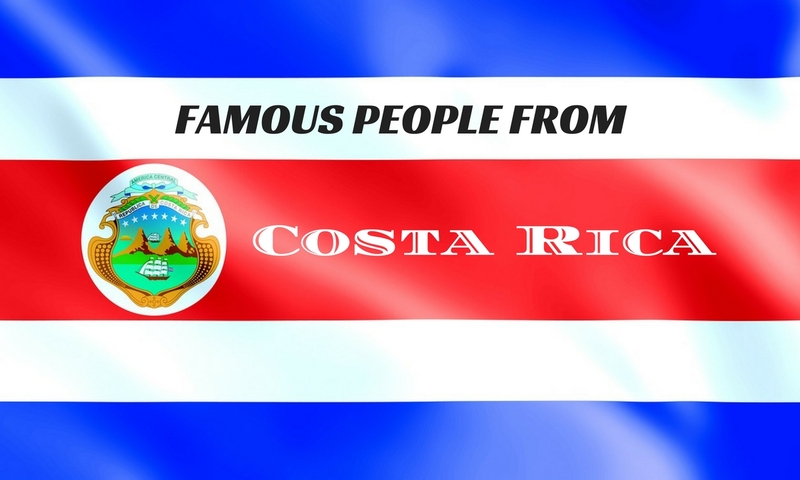 Who are the Famous Costa Ricans? Costa Rica, even though a small nation has prominent citizens who have been successful in leaving a mark in the world for their contributions be it in politics, music, arts or sports. These people inspire fellow people to achieve success and name and to bring laurels to the country in all fields. Oscar Arias Sanchez was born on 13th September 1940 in Heredia, Costa Rica. He is the recipient of coveted Nobel Peace Prize in the year 1987 in taking an active lead to diffuse the Central American crisis. Also he has received the Albert Schweitzer Prize for Humanitarianism. He ran for the president’s post and won it in 1986. It was during this term that he successfully helped in ending the various armed conflicts in Central America. He had designed a peace plan which was approved and supported by Honduras, Guatemala, El Salvador, Nicaragua and Costa Rica. This peace accord won him the Nobel Peace Prize. His term ended in 1990 and he again became the president for the second time from 2006 to 2010. Jose Maria Hipolito Figueres Ferrer was born on 25th September 1906 and he passed away on 8th June 1990. He was the president of Costa Rica three times from 1948 to 1949, 1953 to 1958 and from 1970 to 1974. He formed the Social Democratic Party and fought and won one of the most gruesome civil wars of Costa Rica. After the win, he became the President of a junta known as the ‘Junta Fundadora’ and ruled for 18 months. During the short time he was in power, he brought about radical changes and reforms which resulted in improvement of the country’s governance. He handed over power to Otilio Ulate after 18 months after a successful democratic election and after that Costa Rica has been a politically stable country. He was awarded the ‘Shining Star’ by the Republic of China in 1955, when he was the president for the second time. During his third time as president, he helped Costa Rica turn around its crippled economy by discovering a new market by selling coffee to the Soviet Union. Juan Santamaria, a brave soldier was born on 29th August 1831 in Alajuela, Costa Rica. He is credited as a true national hero of Costa Rica with 11th April every year being celebrated as Juan Santamaria Day to commemorate his death. The story goes that an American named William Walker attempted to overthrow many of the Central American nations after gaining power. The then president of Costa Rica, Juan Rafael Mora Porras, appealed to the people of his country to raise weapons and fight against William Walker. The so formed militia marched upto Rivas in Nicaragua defeating all the small enemies on their way. In Rivas, the enemy camp was put up in a hostel and the only way they could be defeated after several failed attempts was to burn down the hostel. It was due to Juan Santamaria’s heroic act that he was able to torch down the hostel before he died wounded by the enemy fire. Thus the militia was able to defeat William Walker. It is particularly for this heroic act that he is a celebrated hero and one of the airports in San Jose has been named after him as the Juan Santamaria International Airport. His statues are found everywhere as you step on to Costa Rica. Wasn’t he a brave soldier after all? Francisco Amighetti was a very famous painter of all times in Costa Rica. He was born in 1907 in San Jose to Italian origin parents. Other than drawing and painting, he was also drawn to xylography. Here the image is carved first on a block of wood. Then ink is smeared on the block and the image is transferred to the paper. One of the most interesting facts about Francisco Amighetti was that he was also a poet and had published his collection of poems. He died in the year 1998 and till his death he had created over 500 pieces of art. His artworks are the most valued today and are displayed in museums worldwide. Now, if we need to speak of the current crop of famous people who are an inspiration to the younger generation, we have heroes in sporting fields, movies and on space missions. Franklin Ramon Chang Diaz was born on 5th April 1950 in San Jose, Costa Rica and is a former NASA astronaut. He is currently an American citizen and is a member of the NASA Astronaut Hall of Fame. He shares the record for the most spaceflights having completed seven space shuttle missions and he was the third Latin American to venture into space. He has received several awards from the government of Costa Rica in honor of his achievements and works. Claudia Maria Poll Ahrens was born on 21st December 1972 and is the only gold medalist of Costa Rica. She won the 200 meter freestyle swimming event to clinch the first ever gold medal for Costa Rica in the 1996 Olympics. In the subsequent 2000 Olympics, Claudia won two bronze medals for Costa Rica. In the year 1997, she was named the World Swimmer of the year by Swimming World Magazine. Silvia Poll is the sister of Claudia Poll and has the credit of winning the first ever Olympic medal for Costa Rica. She won the silver medal in the 1988 Olympic Games in the women’s 200 meter freestyle. Both the sisters have set many national records in swimming and have many awards to their credit. Nery Brenes was born on 25th September 1985 and he had reached the semi-finals at the 400m sprint in the Olympic Games held in Beijing in the year 2008. He is a sprinter of Costa Rica and has participated in many track and field events. Brenes has participated in many events like the 2012 IAAF World Indoor Championships and the 2007 World Championships in Athletics in Osaka, Japan. Paulo Wanchope was born on 31st July 1976 in Heredia, Costa Rica and is a very famous former footballer of Costa Rica. He played in the 1995 FIFA World Youth Championship finals in Qatar as a member of Costa Rica’s youth national team. Laura Chinchilla Miranda was born on 28th March 1959 in San Jose, Costa Rica and was the president of Costa Rica from 2010 to 2014. She carries the honor of becoming the first woman president of Costa Rica and the eighth woman president of a Latin American country. Prior to that, she was one of the two Vice-Presidents of Oscar Arias Sanchez. She now teaches at Georgetown University. She is still one of the most powerful women in Latin America and she takes up social and environment causes in Costa Rica. Giannina Facio was born on 10th September 1955 and is a famous actress and producer of Costa Rica. She has played the wife of Russell Crowe’s character in Gladiator and in Body of Lies. She has appeared in numerous films and has partnered with Ridley Scott in most of his movies. Deborah Nowalski Kader was born on 6th August 1980 in San Jose, Costa Rica and is better known by her stage name Debi Nova. She is a singer-songwriter who has collaborated with many artists. She had been nominated for 2014 Latin Grammy Awards for the category of Best New Vocal Pop Album for her album SOY. She currently resides in Los Angeles, America. Costa Rica, being a small country has never had its fame known to the outside world. The people famous in Costa Rica are people of repute who have strived hard to be the pride of the people of Costa Rica. And that is exactly the reason why the people of Costa Rica love their famous personalities and will continue to treasure the rich culture and history of their country.